Antwerp is a major gateway to the world for German industry, indeed it is oft referred to (tongue in cheek) as Germany’s second port! The border city of Aachen is the point where traffic flows from the Ruhr and the Rhine to the Belgian port(s) come together. Rail geography dictates that the larger, and most international, of these two flows (Cologne) must reverse in the city before going forward to Belgium. We follow the activity at various locations in the city then follow the line west into Belgium (now the Montzen Line) to Visé where it crosses the Maas and the Albert Canal. 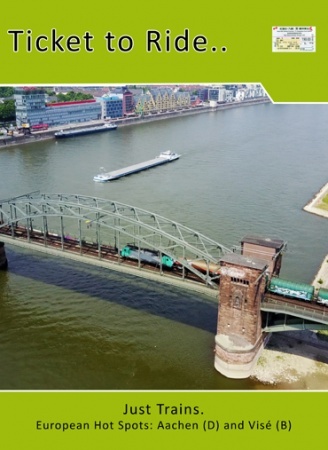 Highlights include a full load of Audi A3s from Brussels at Aachen, a 700m long train of FIAT 500s crossing the canal and a B-Logistics TRAXX with long wagonload on the Cologne south bridge filmed from the air.